A gentle, light and non-oily facial day cream. Nutrient-rich avocado oil helps create a healthy, plumped visage to decrease the appearance of fine lines. Antibacterial manuka flower oil promotes the perfect, blemish-free complexion. You can thank avocado oil’s high levels of plant compounds called phytosterols for transforming tired and stressed skin. Aqua (water), Lavandula Angustifolia (lavender) Distillate*, xanthan gum, Butyrospermum parkii (shea) butter, Rosa canina (rosehip) oil*, Persea gratissima (avocado) oil*, Macadamia ternifolia (macadamia nut) oil*, cetearyl alcohol, wheat straw glycosides, Simmondsia chinensis (jojoba) oil*, Leptospermum scoparium (manuka flower) oil, tocopherol (Vitamin E), Naticide® (natural preservative with fragrances of sweet almond & vanilla pod). *Certified organic ingredient. Delicately apply cream to your face, neck and décolletage at sunrise in upward strokes. 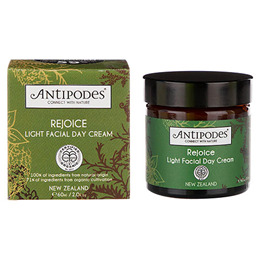 Below are reviews of Antipodes Organic Rejoice Light Facial Day Cream - 60ml by bodykind customers. If you have tried this product we'd love to hear what you think so please leave a review. A gentle, light and non-oily facial day cream. Nutrient-rich avocado oil helps create a healthy, plumped visage to decrease the appearance of fine lines.